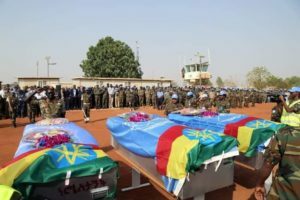 The bodies of four Ethiopians killed Saturday when a military helicopter crashed inside the compound of the UN peacekeeping mission in the disputed region between South Sudan and Sudan arrived home on Sunday. According to a statement by the United Nations, 23 passengers were on board when the helicopter crashed during a routine reconnaissance flight from Kadugli in Sudan to Abyei in South Sudan, the oil rich disputed region between the two countries. Ten passengers were injured, three critically, when the MI-8 helicopter crashed in the compound of the UN mission. Ethiopia contributes the largest number of soldiers for the United Nations Interim Security Force for Abyei (UNISFA), 4,500. UNISFA’s acting Head of Mission and Force Commander Major General Gebre Adhana said the incident was under investigation.